Welcome to the Barley Harbor Lodge. We are a Swiss couple and have been living in Newtowncashel on Lough Ree for several years. With the Barley Harbor Lodge we offer you the opportunity to get to know this original area in the heart of Ireland. There is much to discover. Here, the pub is still heated with locally pruned peat in the open fireplace and the locals are always open for a chat over a pint of Guinness or a glass of Irish whiskey. The house is very quiet and is located 3 minutes walk from the picturesque Barley Harbor on Lough Ree. Fishing, walking, cycling (signposted paths off the main road), golfing or just relaxing in the 2500 m2 garden around the house is possible. 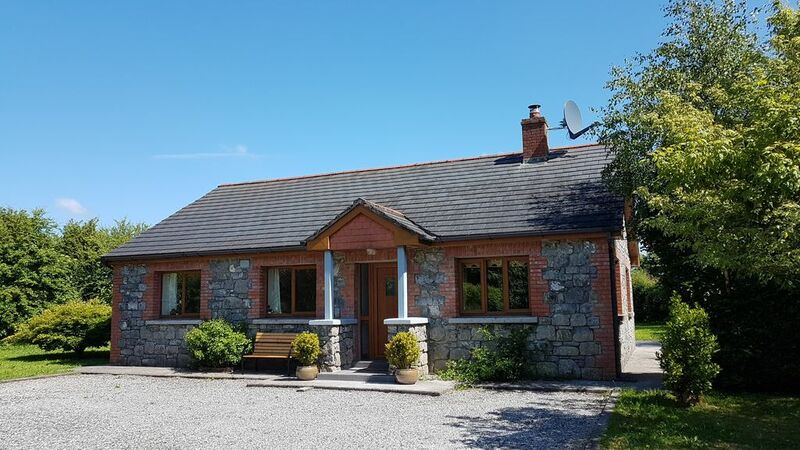 The lodge was built in 2003 in typical Irish style with stone facade and has high quality fittings. In the living room, enjoy the cozy warmth of the blazing fire in the stove in the evening. Read a book comfortably or watch a movie in the 32 inch flatscreen TV. In addition to the Irish channels you also receive Swiss SF1, SF2 etc. as well as German channels like ARD, ZDF, Pro7, RTL, VOX, Sat1 and many more. The house is also heated with central heating. All 3 bedrooms have double beds. There are two bathrooms. The kitchen is fully equipped with fridge / freezer, dishwasher, microwave, Nespresso coffee machine, filter coffee machine, ceramic hob / oven and washing machine. From the large oak table for 6 people they look directly onto the well-kept garden. Due to its central location in the heart of Ireland, day trips to almost all of Ireland's famous attractions are possible. Be it the Cliffs of Moher, a stroll through Galway, a drive through the lovely landscape of Connemara National Park. Yes, even a trip to the famous Giants Causeway is possible. In one hour you can reach different beaches on the Atlantic Ocean. We have known Ireland for over 30 years and are happy to share with you our insider tips for trips and sightseeing. Dublin Airport is just 90 minutes away. Of course, the region is also very well known among anglers. For example, the Lough Ree World Championships in pike fishing take place every spring. The chance for a meter of pike is probably nowhere as big as here. In addition, Lough Ree is no longer an insider tip for wild trout / brown trouts even among Irishmen. The May Flies lure attracts anglers from all over the world to Lough Ree every year in May and June to witness the unique spectacle and chance of a capitalized Brown Trout. Of course, the Egli / perch anglers are not too short here either. This predatory fish is almost unclaimed by the Irish and accordingly are the stocks in the lake or the tributaries. Anyone who wants to experience something different, should make a trip with a fishing charter boat to deep sea fishing on the Atlantic Ocean. We have contacts to skippers in Westport and Clew Bay and are happy to help with the reservation. Internet, bed linen, bath towels, electricity, oil heating and final cleaning are included in the price. A perfect location if you want to get away from it all, every conceivable requirement in a modern and attractive cottage with lovely surroundings. 3) There is only one word to describe our first impressions of the house and its surroundings- Wow! 4) Eva showed us the house and explained each and every bit of information that we could need while we were there. 5) The house has a Wifi (could not see mentioned in the description) so our children were very pleased. 6) Eva had come to welcome us and hand over the keys -she is friendly and very professional. The owners had taken care of everything that could be required during the stay and I mean everything (even with instructions to use the appliances). 7) The house is situated at about 3-5 minutes of walking distance from the lake (Barley Harbour) . 8) Longford town is about 30 min drive- here you can find the superstores (Tesco/Aldi/Lidl etc.) There are other small grocery stores that we found a bit closer. 9) Most of the places that we visited during our stay were from 30 min (around Longford) to 2.5 hours ish (Galway and Cliffs of Moher) of drive. 10) All in all the stay was perfect for us (family of 5) -the house with its amenities were excellent/the surroundings were beautiful and the villagers are friendly and we really enjoyed- Thanks to Eva and Freddy. Would recommend. The best holiday home that I have ever stayed in. The house was absolutely wonderful. We were only there for a weekend snd didn't have time to "find" everything in the house as it was so well equipped. For the coffee aficionados there are at least three coffee machines - there might be more!. Eva was a wonderful host and took great pains in welcoming us, even to the extent of having a fire lit for us. All in all a great place to spend a lovely relaxing weekend. Wir wurden herzlich empfangen und haben uns sehr wohl gefühlt. Das Ferienhaus ist aussergewöhnlich gut ausgestattet und man fühlt sich gleich zu Hause. Wichtig zu wissen ist, dass man auf jeden Fall ein Auto braucht, wenn man die Gegend erkunden und die Sehenswürdigkeiten der Region besuchen möchte. La maison est très confortable et très bien équipée. Wir verbrachten wunderbare Ferien in diesem sehr gut ausgestatteten Haus. Die Anfahrt verlief dank Evas Beschreibung unproblematisch. Sie zeigte und erklärte uns alles. Hier fanden wir eine sehr gute Ausstattung, die keine Wünsche offen ließen. Dank der zentralen Lage waren auch Ausflüge nach Galway und Dublin möglich. Das vorhandene Wifi freute die Kinder (und uns) und funktionierte problemlos. Herzlichen Dank an Eva, wir würden jederzeit wieder dort Urlaub machen!